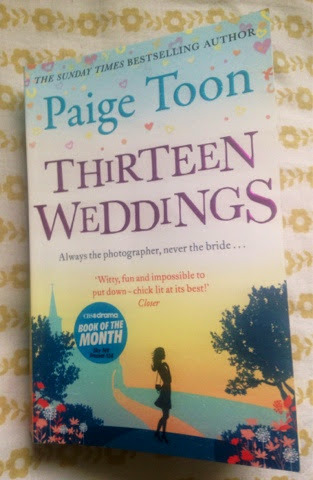 I am ashamed to say that I knew very little about Paige Toon before I picked up Thirteen Weddings, I had read One Perfect Summer a couple of years ago but other than that she hadn't featured. Thirteen Weddings however changed that and I went straight onto Amazon and I now have a truckload of her books coming my way! Thirteen Weddings had me up till 4:30am and if her other books are anywhere near as good then I know I will be losing out on lots of sleep in the next couple of weeks! The book follows the life of Bronte, an aussie who finds herself partaking in a one night stand with the lovely Alex following the hen night of an old friend whilst in London. Bronte then goes home to Australia but a year and a half later she returns to London where she bumps into said one night stand. Alex is your typical romantic lead, handsome and intelligent, in my eyes a perfect match for the witty Bronte. Sadly a year and a half on from their first and only meeting, he is now engaged and unavailable. But love knows no boundaries and if you want to find out what happens next then get yourself down to your local bookshop or get out your e-reader pronto! I fell in love with Bronte from the word go, I warmed to her personality and the style of the writing made me feel as though I was immersed in the story. Alongside her, I too fell for the handsome Alex and I found myself rooting for them to get together. I laughed and cried my way through it, I love nothing more than a book that genuinely makes me feel emotion. But what I loved most about this book was that it wasn't a simple boy meets girl love story, there were many twists and turns and there were enough strong characters to carry the story. The only disappointment for me was the underlying story of her life back home in Australia, I felt as though more could have been said about her past and her parents and I feel as though it would have really enriched Bronte's character. Other than that I loved the book and I wouldn't hesitate to recommend it. This is my first proper book review so it may seem like a bit of a mess, I just blurted out all of my views. I hope you have enjoyed it!